A Russian film, ‘Leviathan’, by renowned director Andrey Zvyagintsev has won the Golden Globe for best foreign language film, for the first time in almost 50 years. The feature is based on the Book of Job and puts it into a modern perspective, focusing on a man who attempts to contradict a powerful and corrupt mayor in a provincial Russian seaside town, after finding out that his house is going to be demolished. “Thank you, we are extremely happy! 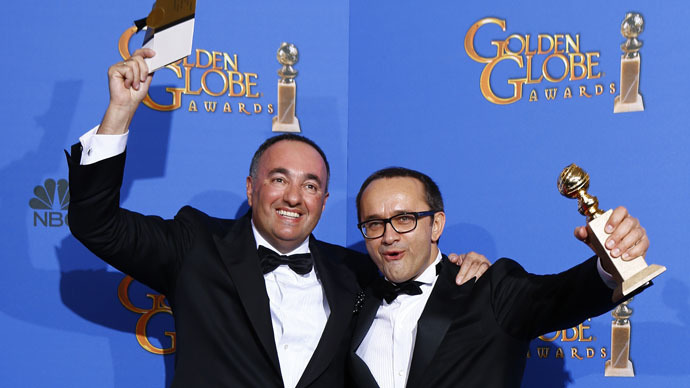 We are very grateful to the Hollywood press, to the public, we would like to thank you,” said Andrey Zvyagintsev. “We are very glad about such recognition for the movie. This award is a huge victory for the Russian cinema – over the whole history of the awards only one movie won, ‘War and Peace’ by Sergey Bondarchuk far back in 1969,” the film’s producer, Aleksandr Rodnyansky, said at the ceremony, as quoted by his press service. The movie premiered at the Cannes Film Festival last May and garnered the prestigious Best Screenplay award. The movie also recently bagged the Palm Springs Festival award for best foreign language film. The next big event for ‘Leviathan’ will be the Oscars. Among other nominees was the Polish film ‘Ida’ by Pawel Pawlikowski, which did very well at recent European Film Awards, taking home five prizes, including those for best film and best director. ‘Leviathan’ also competed against Sweden’s ‘Force Majeure’ (Turist) by Ruben Ostlund, Estonia’s ‘Tangerines’ by Zaza Urushadze, and Israel’s ‘Gett: The Trial of Viviane Amsalem’ by Ronit and Shlomi Elkabetz. The 72nd Golden Globes Awards were held at the Beverly Hilton Hotel in Beverly Hills, and were hosted by Tina Fae and Amy Poehler. The big winners of the night were internationally-praised ‘Boyhood’ by Richard Linklater (Best Drama, Best Director, and Best Supporting Actress for Patricia Arquette), ‘Grand Budapest Hotel’ by Wes Anderson (Best Picture, Comedy or Musical), ‘Birdman’ (Best Actor in a Comedy or Musical for Michael Keaton).